In 1910, Fred met Florence Awilda Orcutt at the train station in Warsaw, Indiana. Fred was thirty years old and Florence eighteen. After she graduated from Warsaw Teachers College, they were married. Learning that the U. S. government had a Civil Service job vacancy in Alaska, Fred applied and was accepted. He was commissioned to teach Eskimos how to raise and herd reindeer. Up to that time, Eskimos had hunted reindeer when migrating herds passed their way. If, for whatever reason, the herds failed to materialize, a serious shortage of food resulted and many Eskimos died. Fred and Florence boarded the Cordova in Seattle, bound for Nome, Alaska. During the voyage, rough weather was encountered and, while hanging onto the rail, Florence unfortunately lost her emerald wedding ring over the side. Leaving Nome on dog sleds, the Sicklers arrived at Shungnak, their new home. It was a small Eskimo village of 300 people on the Kubuk River in the Waring Mountains, 150 miles east of Kotzabue and 25 miles north of the Arctic Circle. Fred sent for a crew of Laplander herders, whose job it would be to train the Eskimos in domesticating reindeer. The process was highly successful and the Eskimos rapidly became excellent herdsmen. Fred lived at Shungnak for eleven years and, during that time, learned the Inuit language, taught school, and treated the Eskimos with an all-purpose silver compound for tuberculosis, syphilis, smallpox, and childhood diseases. 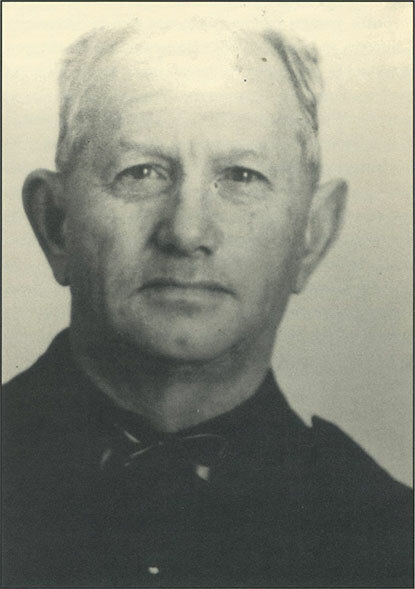 He was appointed Deputy U. S. Marshal for the area. The Astronomical Society in Washington, D.C., sent a special camera to Fred, asking that he attempt to photograph the Aurora Borealis. His photographs were of such high quality that Fred received congratulations and thanks from the Society and, eventually, a letter of commendation from President Warren Harding. Fred’s photographs of the Aurora Borealis were said to be the first ever published. During the years above the Arctic Circle, Florence had been busy, too. In addition to serving as a full-time school teacher, she nursed the Inuits for all kinds of diseases and injuries. One day, an Eskimo boy fell into a steaming cauldron of dog food, suffering serious burns over much of his body. Florence’s nursing skills saved the boy’s life and most of the terrible burns healed with time. His fingers had welded together and it was necessary for Florence to separate them surgically. Many times, she assisted Eskimo women during childbirth; and, when in 1916 her son, Frederick, Jr., was born, Eskimo women served as midwives during her delivery. Frederick, Jr., was first given the middle name of Wilhelm (after the German Kaiser), but the Eskimos were furious that “the leader of the enemy would be so recognized.” Within a week, the Sicklers changed the boy’s middle name to Wilson (after the American president). In 1917, Florence left Alaska to live with her parents in Michigan, while Fred remained in Alaska to finish various government assignments. He joined his wife in Michigan, planning to buy a farm and settle down. But, at the last moment, they changed their minds and moved to Los Angeles, California. There, Fred went to work for the Nick Harris Detective Agency as an investigator while Florence handled the main desk. For many years, Fred had been interested in law. Out of a job and with nothing to do, he entered San Diego’s Balboa Law School, from which he graduated. During this law phase, he was befriended by a man by the name of Judge Crane who had built a big home in Pala. The judge’s second love was gem mining and he needed a foreman for his Pala Chief mine. Fred got the job and moved into his father’s little house at the bottom of Heriart Mountain. There were no modern conveniences in the house because his father, M. M., had not liked modern plumbing. Water was piped to the outside of the house from a spring up in the canyon. When M. M. needed water, he had reached out the window for it. M. M. had much preferred crystals and rocks to flowers for household decoration. Every shelf in the house was loaded with crystals. Just south of the house, M. M. had planted five acres of muscat grapes, some of which still produce today. When Judge Crane died, the mines changed hands and Fred was once again out of a job. The Sicklers leased their house and moved to Oceanside, where Fred became a city policeman. He rode a bicycle to work. His boots were brightly polished, his pants carefully pressed, and at times he wore no jacket, only a T-shirt. It is said that he was quite proud of the well-muscled chest he had developed working in the mines, and wished everyone to see it. The M. M. Sickler (1910) house at Pala, later occupied by Fred Sickler, Sr.
Two years later, Fred became a constable for San Diego’s North County area, which extended from Del Mar to the Riverside County border. He drove a Model T Ford. In 1929, the stock market crashed and the resulting depression cost Fred his constable’s job. Fred spent much of his remaining life back at the Pala mines. One day, early in the morning, George Ashley was busy “high-grading” (entering and working another’s mine without permission) one of Fred’s mines. “High-grading” was a practice that nearly all North County miners indulged in sooner or later. However, by chance, Fred had driven to his mine; and, upon seeing Ashley “prospecting” on the dump, he began to fire his pistol into the air. As Ashley took off over the dump, Fred’s hastily vacated and unbraked car started to roll backward down the road with Fred in frantic pursuit. Ashley fortunately got away, but there is no record of what happened to the car. After an incredible life, Fred Sickler, Sr., died at the age of 84 and was buried in the Old Timer’s Cemetery at San Luis Rey. Fred’s younger brother, Allan, was born in Sacramento, California, on January 7, 1881. He grew up in Pala and spent considerable time exploring the mountains to the north and northeast in search of gemstones. Tiring of this activity, he moved to San Diego, where he attended Russ High School. It is not known where he received his education and training in engineering, but he became one of the most noted hydroelectric engineers in the water-conscious West. His specialty was installing turbine generators in hydro-electric dams. His last installation was at the Bonneville Dam on the Columbia River in Oregon. 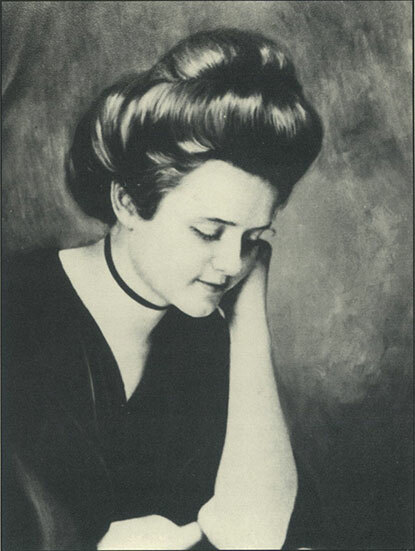 Allan married Nellie Vore, who bore him two daughters: Marion Sickler Monsen and Carol Sickler. Allan died in 1963 at the age of 82. He is buried in the Episcopal cemetery at San Luis Rey. We come now to the subject of my long desired contact with a member of the Sickler family. This was the man whom I interviewed in his home in El Cajon Valley and whose recollections and documentation of Sickler family history has been the basis of this article. Fred Wilson Sickler, Jr., as previously noted, was born on July 29, 1916, in the Eskimo village of Shungnak in far-northern Alaska. By the time he was four, he was fluent in both Inuit and English. When he was six years old his family left Alaska and moved into a house on Normandy Street in Los Angeles. Fred, Jr., attended Los Angeles schools for three years until, tiring of the big city, his parents moved back to Pala and lived in a little house just below the Pala Chief mine. 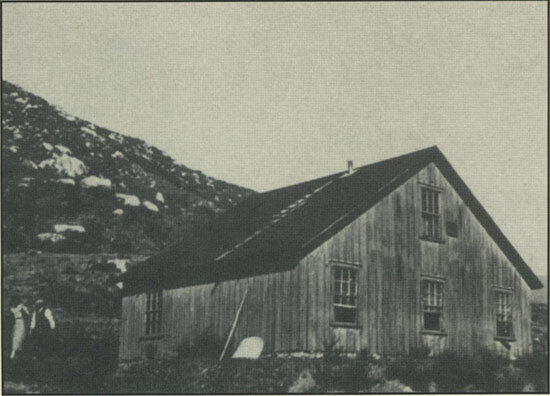 Fred enrolled in a one-room schoolhouse at Pauma Valley. Fred’s mother loved the delicate task of digging out tourmaline crystals. She pleaded with her husband to “hold” the pocket before removing its crystals so that she could help in the removal process. When such a pocket was discovered, she was given mining tools, a chair, a bucket, and an old mattress to place under the pocket to guard falling crystals from damage. On more than one occasion, she filled an entire bucket with the precious crystals. When the tourmaline market “went bust,” the Sicklers moved to Oceanside and eventually bought a home in Carlsbad. Fred, Jr., started school in Carlsbad in the third grade and stayed until graduation. He was a good athlete and liked sports. His specialty was the 50-yard dash, an event he won in the San Diego County Junior Olympics. While still a young boy, Fred, Jr., joined the Oceanside Athletic Club and trained as a long-distance, rough-water swimmer. Fred and his sister, Elizabeth, swam in the annual Silvergate Swim Meet, which swimming stars Buster Crabb and Florence Chadwick also entered. With family resources at a low ebb, Fred, Jr., would do any kind of work for money. One such job was as a bellboy in Carlsbad’s Los Diegos Hotel, “the only decent hostelry between Los Angeles and San Diego.” Movie stars frequently over-nighted at the hotel on their way to or from Hollywood. On a number of occasions, he carried Mary Pickford’s bag. “She was always good for a five-dollar tip,” Fred said. Mary’s brother, Jack Pickford, was also a frequent guest at the hotel. Fred’s next job was as a newsboy with the San Diego Sun newspaper. At first, he sold newspapers on street corners in Carlsbad. When the newspaper issued an “extra,” Fred always sold more papers. Newsboys in those days, before the era of radio and television, went up and down the streets calling out, “Extra, Extra, read all about it,” followed by shouting the “billboard type” headline. The best selling extra Fred ever had was one devoted to Lindbergh’s non-stop flight from New York to Paris. By saving his money, Fred was eventually able to buy a Model T Ford, enabling him to start a delivery route “on wheels.” His mother rode with him, folding and throwing out papers on the right side while Fred folded and threw to the left. The main mine tunnel at the Queen was by then so long that M. M. had found it necessary to install mine track and ore cars to facilitate haulage. He graded the track downhill from the inside of the mine to the end of the dump, making it easier for loaded ore cars to be pushed out of the mine. One day, before returning home, Fred got into an empty ore car and started it out of the mine. The car rapidly gained speed, and Fred was unable to stop it before it plunged over and down the dump. Although unhurt, the young man had a painful experience explaining to M. M. just what had happened. At every opportunity, Fred continued to take part in sports. He entered the popular Pier Swim (the course was a half-mile long, extending around the Oceanside pier) and won second place in the San Diego County open event for junior men. He was also the fullback on the Oceanside High School varsity football team. A number of film and sports celebrities made their homes in St. Malo, a small beach community between Carlsbad and Oceanside. Fred got to know many of them. Movie star Eugene Pallette would assist with some of the high school plays, once taking the part of a bank robber. World wrestling champion Man Mountain Dean frequently ate at the Oceanic Cafe. On demand, Dean and Fred would put on an act for the customers by throwing a beer barrel at one another. Fred’s favorite high school teacher was C. E. Line, who taught manual arts and a course in aviation. Such “vocational teachers” were experienced in the practical knowledge and skills of their specialized area and were not regularly credentialed academic teachers. When the federal government made World War I and later surplus aircraft engines available to schools, Line, who was a pilot in his spare time, realized what a boon aircraft engines could be to his aviation class. 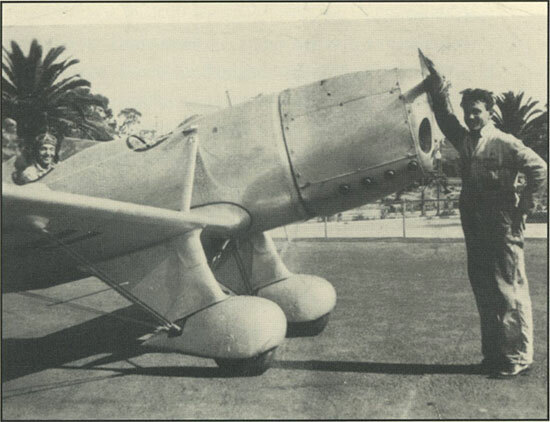 On one occasion, Line sent young Fred to Rockwell Field at North Island to pick up a new aircraft engine. Fred saw his opportunity and signed up for three engines—a Liberty engine, a Hispano-Suiza engine, and a Chance Vought dive bomber. It took a large truck to haul all of the aircraft equipment to the school and to a delighted shop teacher. Fred proved to be a talented, as well as enthusiastic, aircraft mechanic under Line’s supervision. Line soon found that Fred needed more instruction than he could give and encouraged Fred to leave high school and enroll in a new six-month course at Ryan Aeronautical School in San Diego. There, Fred’s instructors were some of the country’s best aviators. Earl Pruden was Dean of Men, and owner T. Claude Ryan also taught at the school. Fred’s next school was the Madison Flying School, where he worked for his tuition. Graduating at the age of seventeen, he joined the U. S. Naval Reserve and was placed on active duty aboard the USS Langley, an early aircraft carrier. His sea duty included cruises to Honolulu and Midway Island. He was on deck when American battle fleets formed the historic last “line” of battleships. Fred was now fully licensed both as a pilot and mechanic. After being honorably discharged from the Navy, he attended a military aircraft fly-by at the San Diego World’s Fair in August 1935. Participating aircraft were from the carriers Ranger, Langley, Lexington, and Saratoga. At a party during that event, he met Vera Faye, whom he married on June 6, 1937. Fred’s first civilian job was as an assembler for Douglas Aircraft in Santa Monica. Next, he went to work for Boeing Aircraft in Wichita, Kansas, assembling B-17 bombers for the Army Air Corps. In 1941, Fred’s mother wrote that a foreman’s job in wing assembly was available at Consolidated Aircraft (later Convair) in San Diego. Fred applied for and got the job. Although only in his early twenties, Fred was placed as foreman over some two hundred specialists working in the machine and assembly shop of the experimental division. Fred came to know the company’s crusty owner, Major Reuben Fleet, who would stop by Fred’s office each Christmas season to say hello. After World War II ended, Fred stayed on with Consolidated and, following his interest in radio, became vice president of the company’s Radio Club. Spurred by the success of the Soviet Sputnik satellite, company scientists and engineers pushed their intercontinental ballistic missile program (leading to the Atlas missile and space launch vehicle). Fred served in this program. At an elaborate ceremony, Fred was awarded a diamond-studded pin for his twenty-five years of service to the company. Two days later, in the post-war “down-sizing,” he was laid off. After taking his family on a long-postponed vacation to Honolulu, he returned to San Diego and a job with General Dynamics. When a new San Diego company, Chu Associates, needed a chief inspector, Fred was given the job. The company’s main contract was to supply satellite antenna for the Navy. Fred and Vera bought a house in 1940 which nestled among orchards and vineyards on Peach Avenue in Bostonia (now a section of El Cajon). Earl Chantry, Fred and Vera’s next-door neighbor, had been a prospector and knew a little about mining. In the early 1950s, Chantry decided to add a basement to his house and to install a new septic tank. About four feet down, he ran into a layer of gray rock that looked promising. He had samples assayed and was astounded to learn that his ore had two ounces of gold per ton. If there were sufficient ore, the deposit might be profitable to mine, but a mining permit in a residential area would be very difficult to obtain—besides, he liked his house and gardens just as they were. Chantry never explored his vein further. But Fred had not lost his interest in mining and was fascinated by the thought that his house also might be sitting atop a gold mine. 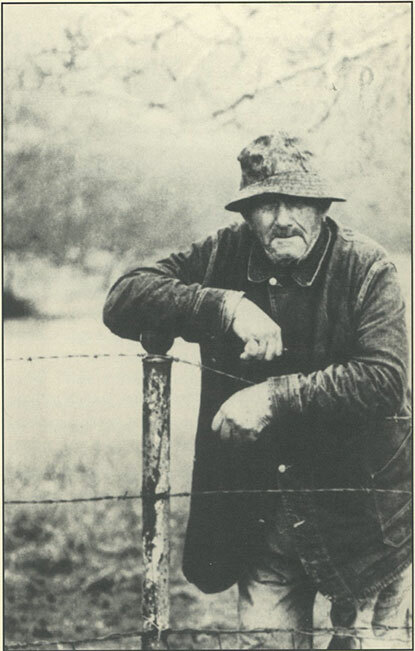 One day, while digging a hole for a fence post, he encountered a layer of gray rock. Sending a sample to the Clarkson Laboratory for analysis, he learned that his rock assayed two ounces of silver per ton, but no gold. His rock was not worth mining. Fred and Vera have three children. Peggy Sickler Denton was born in Wichita, Kansas, in 1938. She attended El Cajon High School and was graduated from San Diego State University with a degree in Education. A school teacher in Oregon, she raised three sons: Matthew of San Francisco, and twins Michael and Christopher of Portland, Oregon. Frederick Wilson Sickler, Jr., was born in Oceanside in 1941. He attended El Cajon High School and was graduated from San Diego State University with degrees in Education and Engineering, followed by a master’s degree in Quality Engineering. After two years as a quality engineer in the aerospace industry, he currently teaches metal shop classes at Roseburg High School in Oregon. His son, Frederick Gregory Sickler lives in Cottage Grove, Oregon. Patricia Sickler Meeks was born in San Diego in 1940. She attended Granite Hills High School in El Cajon and majored in Education at San Diego State University. She teaches school in the Cajon Valley School District. Her son, Jeffrey Meeks, resides in San Diego. Her daughter, Holly Meeks Ryan, lives in El Cajon. Lee, Murray K. Interview with author. San Diego. 1997. Kong, Dr. Tom. Interview with author. Ventura, California. 1997. Sickler, Fred, Jr., and Vera Sickler. Many interviews with author. El Cajon, California. Ung, Georgia Quin. Interview with author. Monterey Park, California. 1988. Wong, Maurine. Interview with author. Monterey Park, California. 1997. Salmons, F. A. June 30, 1903. Letter to H. C. Gordon. Gordon, H. C. October 24, 1903. Letter to George Kunz. _____. November 20, 1903. Letter to George Kunz. _____. November 11, 1903. Letter to George Kunz. Kunz, George. November 19, 1904. Letter to H. C. Gordon. Salmons, F. A. May 3, 1919. Letter to George Kunz. _____. July 21, 1926. Letter to W. T. Schaller. Schaller, S. W. July 13, 1926. Letter to Frank Salmons. Sickler, M. M. August 3, 1903. Letter to H. C. Gordon. Sickler, F. M. August 5, 1903. Letter to H. C. Gordon. Bancroft, Peter. August-September, 1977. The Famous Tourmaline Queen Mine. Australian Gems and Crafts. No. 24:130–133. _____. 1984. Gem and Crystal Treasures. Western Enterprises/Mineralogical Record. 102–110. _____. 1991. Gem Mining in San Diego County. Environment Southwest (a publication of San Diego Museum of Natural History). 1, 2. Baskerville, C. 1903. Kunzite, a New Gem. American Journal of Science. 18:303–304. Baskerville, C., and G. F. Kunz. 1904. Kunzite and its Unique Properties. American Journal of Science. 18:25–28. Berhman, J. January 4, 1993. Wilderness Gardens at Pala. San Diego Union. B-1. Butterfield Express. October, 1966. Pala Mines, John Hilton Tells Tales of Prospecting. 1, 5–7. California State Mineralogist Report. 1890. Minerals of the Colorado Desert. California State Mineralogist Report. 1905. 20–25, 54–63, 124–137. California State Mining Bureau Bulletin No. 37. June 1905. Gems, Jewelers, Materials, etc., of California, 60-63. California State Mining Bureau Bulletin No. 91. 1923. Minerals of California. Freeman, Larry. January 10, 1960. San Diego, A Gem of a Story. San Diego Union. 1, 33. Fletcher, Charles. January 7, 1905. California’s Precious Stones. Los Angeles Mining Review. Southern California Printing Co., Los Angeles. 3. Greely, Adolphus. 1866. Three Years of Arctic Service. New York: Charles Scribner’s Sons. Keen, Harold. December 4, 1949. People in the News, Fred Sickler. San Diego Union. Kunz, George. 1892. Mineral Resources of the United States. U. S. Geological Survey. 12. _____. 1893. Mineral Resources of the United States. U. S. Geological Survey. 18. _____. September 2, 1903. American Journal of Science. (First description of Kunzite). _____. 1913. The Lure of Precious Stones. Philadelphia: J.P. Lippincott. Larson, William. 1972. The “Queen” Reigns Again. Lapidary Journal (San Diego, California). 26:670–76. Lee, Murray K. Summer, Fall 1996. The Ah Quin Story, Parts 1 and 2. Chinese Historical Society of San Diego Newsletter. 4–8, 3–6. Mannix, Daniel P. November 13, 1948. America’s Gem Hunters. Saturday Evening Post. 38, 39, 163–171. Mineral Collector. March 1904. (From the Jeweler’s circular). 11:1–4. Oceanside Daily Tribune. January 21, 1943. Wm. A. Sickler Summoned at Buffalo Home. 1, 6. _____. January 31, 1951. Fred Sickler, Has Life Like a Fairy Tale. Oceanside Federal Locale. Spring 1977. The Tourmaline Mines of Pala. 12, 13. Rynerson, F. 1967. Exploring and Mining Gems and Gold in the West. Healdsburg, California: Naturegraph Co., Publishers. 42–44, 65. Salmons, F. A. 1914. The Pala Chief Gem Mining Co. San Diego, California. 16. Schaller, W. T. 1903. Spodumene from San Diego County. Bulletin of Geology, University of California. 3:265–75. _____. 1905. Analysis of Tourmaline and Associated Minerals from San Diego County. U. S. Geology Survey Bulletin. 419. Sinkankas, J. 1960. Gemstones of North America. Princeton, New Jersey: D. Van Nostrand Co. 150–66. Sterrett, D. 1904. Tourmaline from San Diego County, California. American Journal of Science. 17:459–65. Warner, Tom, and John Grieger. 1932. Published List of Gem Spodumene Samples Offered for Sale. Pasadena, California. Weight, Harold O. 1955. 20 Mule Team Days in Death Valley. The Calico Press. 33–36. Woehlke, Walter V. April 1911. On the Trail of the Emerald. The World Today (Chicago). 430–35.